Lemon gems (or fried egg biscuits, as they are known round here), are delightfully crumbly-yet-crisp, tart little morsels of loveliness. Plus they look so cute! The recipe is from Nigella’s How to Be a Domestic Goddess. Preheat the oven to 350°F (175°C). In a large bowl, cream together the shortening, butter and sugar. Add the egg yolk, lemon juice, zest and salt. Fold in the flour, followed by the ground almonds and corn flour, then chill the dough for at least half an hour. Form the dough into walnut-sized balls and arrange — two inches apart — on baking sheets lined with baking parchment. Indent each biscuit with your thumb. Bake for about twenty minutes, until the biscuits are golden and firm. 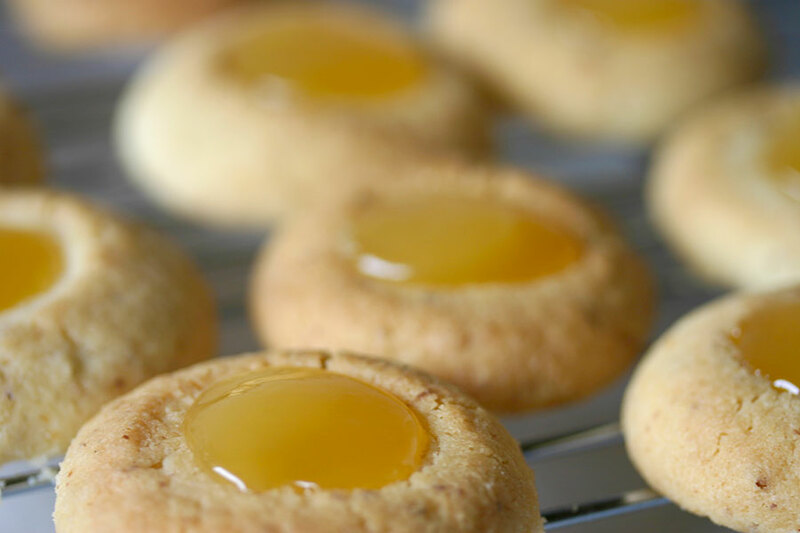 As soon as they come out of the oven, fill each biscuit with a half teaspoon of lemon curd, then transfer to a wire rack to cool.